Jeff has been teaching agility classes in the Chicagoland area since 2009. He began agility training with his own dogs in 2003 and has been competing with his third dog, Motu. He recently began to train his fourth dog Piper and will soon be competing in CPE agility with her. Motu earned his U-ACHX title in UKC agility, his C-ATCH3 and C-ATE8 titles in CPE and was CPE’s #1 dog in the Veterans/Regular category for 2013, 2014, 2015 and 2017. He will begin running Piper in CPE agility trials in the near future. 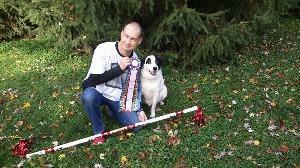 Jeff is a regular at the local CPE trials, spending 25+ weekends a year competing in CPE agility.